I'm an old user and addict of JRebel. I started to use it on open source projects and in professional contexts. From the beginning, I've been convinced that the licensing mode was wrong because of its lifetime. Asking for license renewal each year is boring. So, I decided to look for FREE alternative solutions and finally I recently found one. I tested it with Java 7 & Java 8. I work on web applications that run on Tomcat. I developed wih Spring (IoC), sometimes Hibernate and Vaadin. Once it is done, it supposes that you run your project with Maven. For example, I use to start my webapp projects with mvn tomcat7:run or mvn jetty:run. 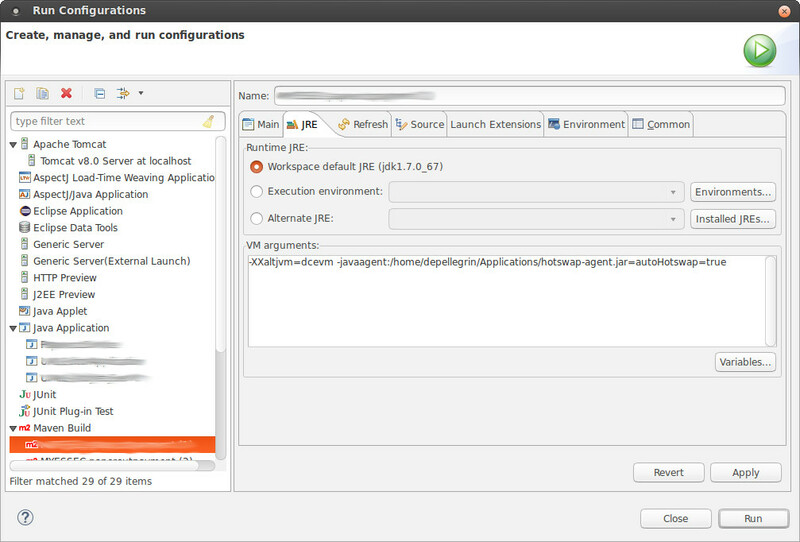 It could be done from Eclipse directly from the context menu. Thus, you will not need Eclipse WTP anymore. These extra logs show your HotSwap Agent activity. This is helpfull because in some cases, hot reloading doesn't work. It also happens with JRebel, but honestly (and fortunately) in less cases than this free agent. Next step : the debugger. If you want to hotswap code changes, you also need to debug it. But, then projects are started with Maven in debug mode (Debug As... instead of Run As... ), Eclipse doesn't link the source code with the code which is executed. To fix this problem, just install the Eclipse plugin from the menu Help > Install new software as it is explained in the project's page here : https://github.com/ifedorenko/com.ifedorenko.m2e.sourcelookup. That's all. I hope you will enjoy your new life with dynamic reloading of code changes and enjoy the benefits of a strongly compiled programming language like Java associated with the flexibility of an interpreted language. Thanks for the info, really appreciate it.